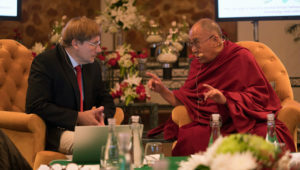 New Delhi, India – His Holiness the Dalai Lama greeted several old friends when he reached the hall in which Russian scientists and thinkers were meeting Buddhist scholars. He then examined an exhibition dedicated to Agvan Dorjiev with some interest. This Buryat monk first entered Tibet with his teacher in 1873. 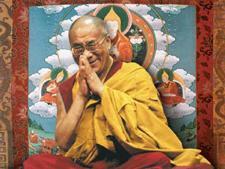 He went on to study at Drepung Gomang Monastery, where he earned a Geshe Lharampa degree. His appointment as a debating assistant to the Thirteenth Dalai Lama was the start of a close relationship that extended into far-reaching connections between Tibet and Russia. “I’ve had useful discussions with scientists for more than 30 years with two purposes in mind. The first is to extend our knowledge. Until the late 20th century scientists mostly investigated external phenomena, including the brain. These were things they could measure and which a third person could agree about. However, in the late 20th century and early 21st century more and more scientists have begun to find evidence that such experiences as meditation and mind training affect our brains in previously unforeseen ways—this is called neuroplasticity. “The second purpose relates to the sad reality that although we are sitting together peaceably here, enjoying each others’ company, elsewhere people are being killed, the gap between rich and poor continues to grow and children in places like Yemen are dying of starvation. Organized violence—war—including the civil wars in Russia and China, took up a lot of the 20th century. Historians claim that 200 million died violently as a consequence. If a happier and more peaceful world had been created as a result, someone might say it was worthwhile, but that is not the case. In search of a solution to a disagreement, people resort to the use of force. The consequent violence just fosters further violence. “We have to learn from experience and enter into dialogue, remembering that others are our human brothers and sisters. We have to live together. The global economy and the effects of climate change are not limited by national borders. It’s the idea of ‘us’ and ‘them’ we have to restrain, because it so easily becomes the basis for violence. We have to educate people to understand that we are all part of humanity. His Holiness also acknowledged that it’s useful that Russia recognises Buddhism, which is followed particularly in Buryat, Kalmykia and Tuva, as a national religion. His Holiness took up the question of consciousness and mentioned the Buddhist view that there are different levels—the sensory consciousness of ordinary wakefulness, the subtler consciousness when we dream and the subtlest consciousness that manifests at the time of death. Moderator Tatyana Chernigovskaya invited Prof Konstantin Anokhin, of the PK Anokhin Institute of Normal Physiology, Moscow, to begin his presentation on the ‘Unity of Mind-Brain: Holistic Approaches from the Russian Neuroscience of Higher Brain Functions’. He described the Main project that involves M(ind & Br)AIN, seeking to incorporate mind from a first person perspective (M1), mind from a third person perspective (M3) and brain from a third person perspective (B3). He concluded that mind is a structure and consciousness is a process within it. Yuri I Alexandrov of the Institute of Psychology, Moscow, began his presentation entitled ‘Non-Disjunctive Approach to Consciousness and Emotion: a Culture-Specific View’, by explaining that although we are all human beings and similar in that respect, we are also different. He drew attention to a series of culture-specific differences between Russian and American approaches. The one is reactive, the other active. For one certain things are forbidden, for the other they are obligatory, where one takes an analytical stance, the other is more holistic. It was even suggested that given three images—of a cow, a chicken and grass, an American would associate the cow and the chicken as animals, whereas the Russian would associate the cow with grass. His conclusion was that these differences do not represent right and wrong approaches. Instead, because they are complementary, they are helpful and to be appreciated. Tatyana Chernigovskaya of St Petersburg State University spoke entertainingly about the ‘Cheshire Grin of Schrödinger’s Cat: Language and Mind’. From Nils Bohr noting that ‘the observer is a participant in the quantum world’ to Einstein’s remark that ‘body and soul are not two different things, but two different ways of perceiving the same thing’, she quoted from Kant to Wittgenstein. She discussed language and time in terms of what they can tell us about the mind.